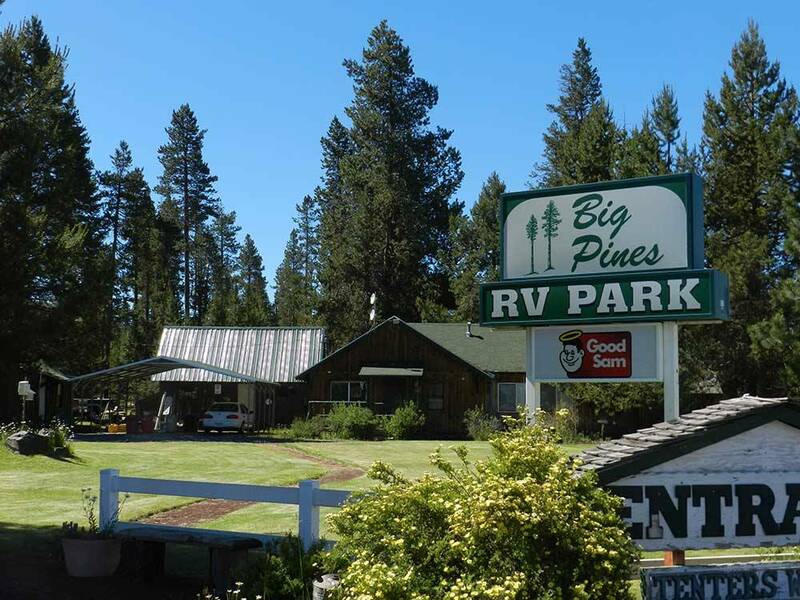 First this is probably the nicest campground in La pine, Or. The staff are friendly, and it is fairly quiet for being so close to the highway. That being said, being the best in town is not saying much, and the campground is lacking attention to detail. The tiny pet walk area had gallon storage bags as pet waste bags. It would probably be cheaper to install a post with an actual pet waste bag dispenser and it would look more professional. The campground is in the middle of expanding which will more than double its size. The new spaces will be close together but not unreasonable. I hope they will pay more attention to details and install more bathrooms. They have 2 restroom buildings serving the entire campground. One has one female stall and one male stall. The other is a single stall shared by everyone. We found the men's shower to be dirty and poorly maintained, the women's was okay. The laundry facility is in a separate building at the very front of the campground facing the street. It was in good shape, but is kept locked and you have to ask for the building to be unlocked to use it. Good luck finding this place at night. The sign is completely dark, and it is easy to drive right on by. The only visible lights are in the laundry facility. With attention to detail this could be a good campground. Pave the main roads, add restroom facilities, light the sign, improve the dog run. The other parks in town look pretty junky. Instead of settling for being just a bit better, go all out and make this a quality park. Spacious sites. Clean and well maintained. Midway between Crater Lake and Bend Oregon. Friendly owners who take pride in their facility. Very accommodating. Spent one night on the way to Reno,wish I could have stayed longer due to other concerns. The park residents were very friendly,the owners were very helpful,the park is very clean I was surprised about the road nose,hardly any. next trip to Reno I will definitely stay here again. Great park, The owner is very friendly and takes great pride in the park. It is clean, well laid out, the restrooms and showers were very clean. It is off the 97, but the traffic noise was not too loud. We would stay here again. We stayed at Big Pines as a layover to Sisters because we arrived during the big Rodeo in Sisters, and there was no where to stay. We are glad we did! Overall a nice park that is well maintained with lots of, you know, big pines. The owner was seen every day attending to some landscaping detail or another. He is also very congenial. The sites are oddly placed which is actually an attribute as it enables more privacy. Our site was gravel, very long and easily made a temporary home for our 45 foot motorhome. We had a nice big "yard" with a picnic table and fire pit. We were also able to hang a newly purchased hammock between two trees :) The only dings are the inconsistent WII FI (in our spot anyway) and the noise from US 97. We would stay here again. The park is clean and well kept-up. Beautiful park, clean, very friendly and helpful. We were staying only 3 days but extended it to 5 days. We weren't in the laundry so can't judge on it but if it was anything like the rest it should be great too. We will be back!